(Photo: L'Osservatore Romano. )Pope Francis meets with Facebook co-founder and CEO Mark Zuckerberg and his wife Priscilla Chan at the Vatican Aug. 29, 2016. Pope Francis has met countless people at the Vatican and his encounter this week with Facebook founder and CEO Mark Zuckerberg was not the first with leaders of the social media and high-tech world. Still "It's difficult to imagine two more different world leaders hanging out together. Zuckerberg was raised in a Jewish home, identifies as an atheist, and professes a profound respect for Buddhism," The Atlantic wrote. 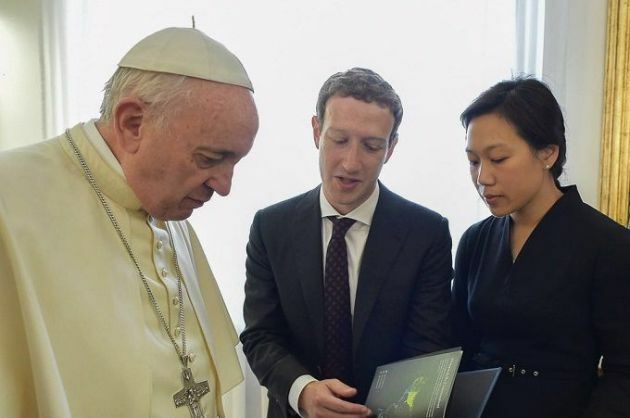 Better-known for wearing gray T-shirts, Zuckerberg, wore a dark suit and tie when he met Pope Francis with his wife Priscilla Chan, to talk also about their philanthropy projects, digitaltrends reported. "We told him how much we admire his message of mercy and tenderness, and how he's found new ways to communicate with people of every faith around the world," he wrote in a post on Facebook. Zuckerberg sat down with the pontiff Aug. 29 at the Vatican to talk about how Facebook is connecting the world, said digitaltrends. He knows Francis is no stranger to social media. Back in February, when the Pope visited Mexico, Vatican Radio reported that the number of papal followers on his @Pontifex Twitter account in 9 languages climbed above 27 million. The most popular language was Spanish with 11,146,700 followers, the second is English with 8,680,000 and the third Italian with 3,365,500. The other languages in order of popularity are Portuguese, Polish, French, Latin, German and Arabic. Pope Benedict launched the @Pontifex account on the 12th of December 2012 whilst Pope Francis sent his first tweet on the 17th of March 2013. "Pope Francis's leadership of the church has been noted for its openness and his concern for the needs of the poor," Jena McGregor wrote in The Washington Post. "And he appears to recognize the power that tech executives have to help spread ideas, mobilize young Catholics and empower the undeveloped world - but also to shape the tools that can also disrupt how we relate to one another." In his 2015 encyclical letter, Francis wrote, "Real relationships with others, with all the challenges they entail, now tend to be replaced by a type of Internet communication which enables us to choose or eliminate relationships at whim." The Pope said this gives rise "to a new type of contrived emotion which has more to do with devices and displays than with other people and with nature." But that does not mean the Church is shunning that power, but rather embracing it in reaching out to younger people. In 2014 remarks on World Communications Day, Francis said "the internet, in particular, offers immense possibilities for encounter and solidarity. This is something truly good, a gift from God." Still he also acknowledged that "the speed with which information is communicated exceeds our capacity for reflection and judgment, and this does not make for more balanced and proper forms of self-expression. "The variety of opinions being aired can be seen as helpful, but it also enables people to barricade themselves behind sources of information which only confirm their own wishes and ideas, or political and economic interests." Zuckerberg's social-media company "claims to have a mission oriented toward creating social good, but in practice, it often leverages its immense influence over the way people use the internet for profit and political power," wrote The Atlantic. "By his own description, the Facebook founder is interested in saving the world through technology: its use, its development, its spread." Back in June 2015 , John Bonazzo wrote in observer.com, that Francis is renowned "for the ways in which he eschews technology - he has publicly stated that he no longer watches television, and he also warned young people about wasting time on the Internet. "But in other ways Francis is the most tech-savvy pontiff yet. He called the Web a "a gift from God" when used properly, and he also tweets frequently to keep the world's Catholics up-to-date on teaching."